The MF 380 was developed to fill the gap between the current MF360 and MF400 models. It has a nominal rating of 24 m3 capacity and a maximum payload of 9,000Kgs to feed up to 150 dairy cows or 450 beef cattle in one load so it is primarily targeted at bigger producers and the export market. Overall the operation is similar to the MF400 but in a more compact design. The machine has all of the characteristics of the popular Mech -fiber® range which have heavy duty blades fitted as standard for a long life. The MF range is optimised for chopping fodder beet, forage maize, grass silage, straw and a wide range of other feed ingredients to deliver a superb mix with the minimal usage of fuel and using lower HP tractors. These claims are supported by independent research reports and farm testimonials from Britain, Holland, USA etc. It was noteworthy that the many beef and dairy farmers visiting the Keenan stand were much more positive than last year. A combination of good weather, lower feed costs and improved milk prices in particular has restored confidence in farming. During the fodder crisis last winter and spring, farmers fortunate enough to own a Keenan mixer wagon were able to stretch their silage with straw, use alternative and less expensive feeds, improve animal health and maintain performance even with lower quality silage. So there is much more interest in the TMR system amongst Irish farmers who would not have traditionally considered investing in a Keenan mixer wagon. 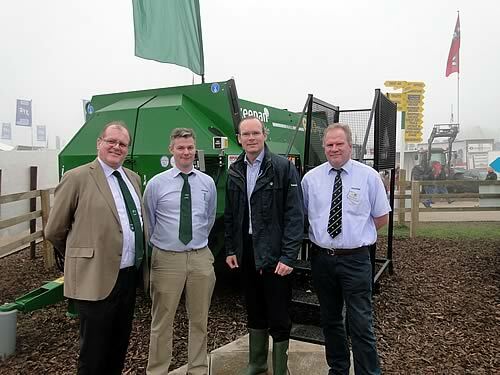 The trend is towards bigger machines while smaller farmers are quite interested in the lower cost Keenan Eco range. Stephen Hennessy, Market Director for Ireland expects that many owners of the older Keenan models will also upgrade to the Mech-fiber range. These models can easily handle bales of silage or straw and significantly improve feed utilisation and fuel efficiency. The axle location has also been optimised to reduce the weight on the hitch to 2.5 tonnes when fully laden. The machine uses .55. profile tyres, 385/55 R22.5, as standard to minimise height. The body design has been optimised so this reduces the peak power requirement and the stress on the machine. The access to the oil bath drive line has been improved so as to allow for ease of access to the complete drive line in open operation. The machine is manufactured with 28 blades as standard and 20 optional additional blades. These are in a double herringbone arrangement and optimised for chopping.